The F.O.R. Maricopa Food Bank passed out 450 turkeys and meal boxes to local families during their annual turkey drive Tuesday afternoon. After boxing up the dry ingredients on Saturday, dozens of volunteers came out to pass out the meals to families in need. For the first time, the food bank instituted a drive through pick-up, and the system allowed volunteers to keep the event organized and constantly flowing. 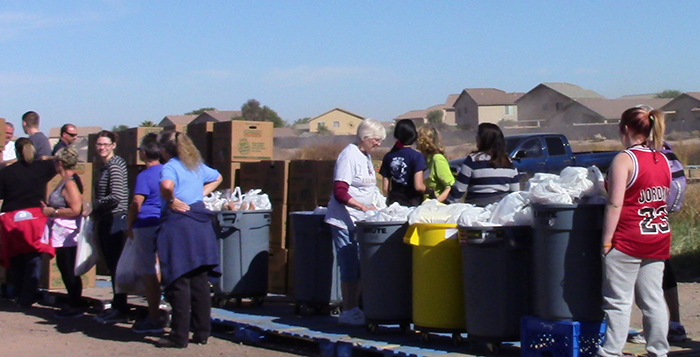 As the city of Maricopa grows, so does the need for meals provided by the food bank. The 450 turkeys and food boxes the food bank gathered are the most they have had for one giveaway. The turkey drive lasted from noon to 2 p.m. at the F.O.R. Maricopa Food Bank location at 44625 W. Garvey Ave. Tuesday afternoon.